Welcome to the rollerskatesupply.com homepage. If you don't know a lot about rollerskates or you just want to be refreshed, the following criteria is used to compare rollerskates. When choosing a pair of rollerskates or complete skate as far as size is concerned, a skate should fit your foot like a pair of shoes with between 1/4" and 1/2" clearance. It depends on whether or not your foot is still growing. Some skates are only offered in men's sizes so if you are buying a woman's skate, you would want to drop down one size. If a custom package is purchased, you want to order only the skate boots so that it can be returned if it is the wrong size. Like shoes, make sure they fit before skating on them. Skate wheels are compared by their hardness or durometer. A softer wheel grips more but is slower and a harder wheel rolls better but has less traction. 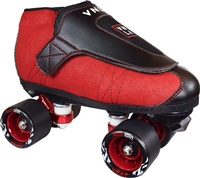 Outdoor skate wheels should have a durometer of 88A or less, and indoor skate wheels are usually rated at 95A, with a rating of less than that is considered to have more grip. Higher than 95A, and skate wheels are considered to be firm. Artistic skate wheels are usually harder wheels so that the skates can change direction easily. Speed Jam Wheels are meant more for speed and gripping at turns. Rollerskate bearings are given ABEC ratings. ABEC stands for Annular Bearing Engineer's Committee which determines the standard for the Anti-Friction Bearing Manufacturers Association. The ABEC rating is used to determine their heat tolerance, rotating accuracy, and other measurements. For the most part, the higher the ABEC rating, the better the rollerskate bearings; however, not all manufacturers rate their bearings the same way and some of the best rollerskate bearings for rollerskates have no rating at all. Skate boots come in high-top or low-cut. They can be made out of leather or microfiber material. The microfiber material may more durable than leather. If your feet are still growing, you might want to buy a less expensive material since you may grow out of them before the skate boots wear out. The rollerskate plates can be made out of aluminum, nylon, or some form of plastic. Depending on the type of skating you do, you would want single or double-actioned trucks, the part that holds the wheels. Single-actioned means the truck has one cushion and they are at a 45 degree angle. Double-actioned trucks have two cushions and they are at a 10 degree angle, which allows the skate to be more responsive and allow for quicker turns. They are also the most common type of truck. Wheels for speed skates have a wide profile, and artistic skates have a narrow profile. With speed wheels you have more traction when cornering at higher speeds, and artistic wheels allow for more responsive turns. There are many different types of skate bags or cases to carry skates other than holding them by the laces.